Every so often I discover a product that thoroughly delights me. If you've been reading this blog, then you know I've got a thing for lions. 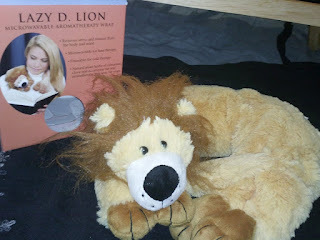 So when I saw an "aromatherapy lion" I couldn't resist. It's made by Dreamtime Inc. and is part of their "Spa Comforts" line. I've been using my "Lazy D. Lion Aromatherapy Wrap" for a couple days now and I am thrilled with it. It can be put in the freezer for a cold wrap to help with headaches and to reduce swelling from injury or it can be heated in the microwave to relieve muscle tension and stress or aches and pains. So far I've only tried the heat application and it's wonderful. The lion is filled with a grain pack containing natural plant herbs cinnamon, clove and eucalyptus. It smells fantastic and is soft, cuddly and ADORABLE!